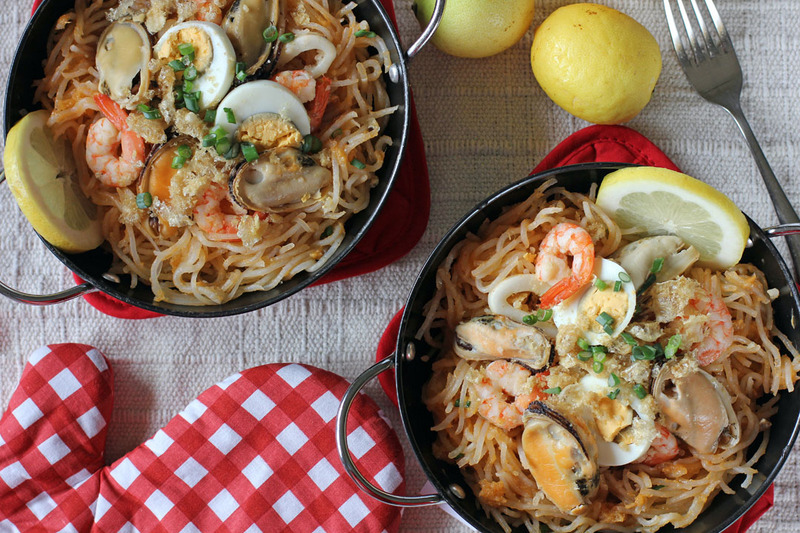 Noodles – Palabok uses bihon noodles which are thin strands of rice noodles while Malabon and Luglug uses a thicker variant same with the ones uses in Malaysian noodle laksa. Sauce – Palabok and Luglug usually is served with sauce on the top of the noodles, Luglug might have more in terms of volume compared to Palabok. If you remember Cafe via Mare’s pancit luglug it is served in a deep dish to accommodate the amount of sauce. Malabon on the other hand does not have sauce and the flavour is already incorporated into the noodles. Toppings – All of these noodle dishes nearly share the same toppings except for the Malabon where I noticed that it also have some squid and smoked fish. Palabok sometimes use minced pork and small tofu cubes. Well like I said those are just observations, I know you also have your own, if yes share them so we can update this. Anyways let’s go back to the dish Pancit Malabon is a dish that originated in Malabon City, Metro Manila, Philippines. It is a noodle dish flavoured and coloured with fish sauce, crab fat and annatto seeds. It is topped with different seafood items as well as crushed pork cracklings and sliced hard boiled eggs. It is popular across Metro Manila and each region will have slight variation with each other, some add fresh spring onions, bean sprouts, salted eggs, bok choy, oysters or even fish eggs to name some. There are also lots of specialty shops that sell this noodle dish where it is sold by the size of the bilao (bamboo round container) where you can buy something as small as a plate where it an feed 4 to as big as a small round coffee table where it can feed 30 people, having said that we barely make this at home as it is cheaper and easier to buy them on shops. This is a really good noodle dish which again I suggest you to try if you haven’t, especially for those seafood addicts there like me. Its also a good dish to serve in New Year because there is a saying in the Philippines that serving noodles during Birthday and New Year give’s long life. On a pot boil water and place rice noodles and cook according to packet instructions. Once noodle is cooked, drain and then set aside. Boil shrimps, mussels and squid in the 2 cups of water for sauce. Once cooked drain keeping the liquid, set the seafood aside. Shell the shrimps and reserve it. Pound the shells with a mortar and pestle to extract the juice, place pounded shells and its liquid in a muslin cloth or fine sieve over a container. Run the water used for boiling on the pounded shells and drain it in a container. Set the liquid aside. Shell the mussels and set it aside. On a blender mix crab meat, crab fat, water used for boiling, annatto powder and fish sauce, blend in low speed for a minute. Remove from blender then set aside. On a pan, add oil and sauté garlic and onion. Add the blended crab meat mixture and flaked smoked fish. On a separate container mix cornstarch with a small amount of water, dilute it until it’s free of lumps then add it to the pan. Bring sauce to a boil and simmer until sauce thickens, add water if sauce becomes too thick. Turn off the heat. Place noodles in a big bowl pour sauce on top then mix to distribute sauce evenly to the noodles. Place noodles in a big plate then top with cooked seafood, Pork crackling, Spring onions, eggs and fried garlic. Very informative indeed. Happy New Year Ang Sarap..
Delish outs, gorgeous noodles and tasty fresh seafood. I love a festive feast and these are a great way to ring in the new year. We tend to go for a bucket of prawns at home but next time you have me inspired to toss through those noodles! Happy nom noms and cooking for 2013! A beautiful photo, a dish I’ve never heard of but immediately want to make … just another day … Happy new year! That looks amazing. Happy New Year! Mmm this looks really yummy I’ve been making a lot of noodle dishes lately! This looks so delicious Raymund. Being a seafood lover as well, I know I would enjoy this. I missed making it on New Year’s, so maybe for a birthday. 🙂 Happy New Year to you too! I.miss.this. I will make sure I will have a serving (or two!) when I go home. Happy Belated New Year Raymund – I wish you a prosperous new year 🙂 This looks so yummy, something that I can eat everyday for sure. sarap! thanks for sharing this! happy new year!